Garden & Gun features Jefferson’s Journey tasting of “The Most Expensive Bourbon Ever Made!”. The Kentucky bourbon Trail Welcome Center at the Frazier was mentioned in this Chicago Tribune article about places to go and things to do in Louiville! Insider Louisville recently featured our new addition to our Bottle Wall - #MyBourbon#. Read the article here! WHAS11 gives a sneak peak of the inside of The Kentucky Bourbon Trail Welcome Center with a short video clip. Watch it here! Forbes magazines commemorates the Bourbon Heritage Month by publishing an article Celebrate National Bourbon Heritage Month in Kentucky, The Birthplace of Kentucky. Celebrate this liquor by touring the Kentucky Bourbon Trail®, the Kentucky Bourbon Trail Craft Tour®, or explore the Urban Bourbon Trail. Read more here! Northern Kentucky Tribune introduces Frazier History Museum as the official starting point of the Kentucky Bourbon Trail® and the Kentucky Bourbon Trail Craft Tour® experiences. Read more here! The Voice Tribune featured the launch of the Kentucky Bourbon Trail® Center and the "Spirit of Kentucky” exhibition. Read about it here! LEO Weekly disclosed that the starting point of The Kentucky Bourbon Trail® Center is in the Frazier History Museum. Read more here! 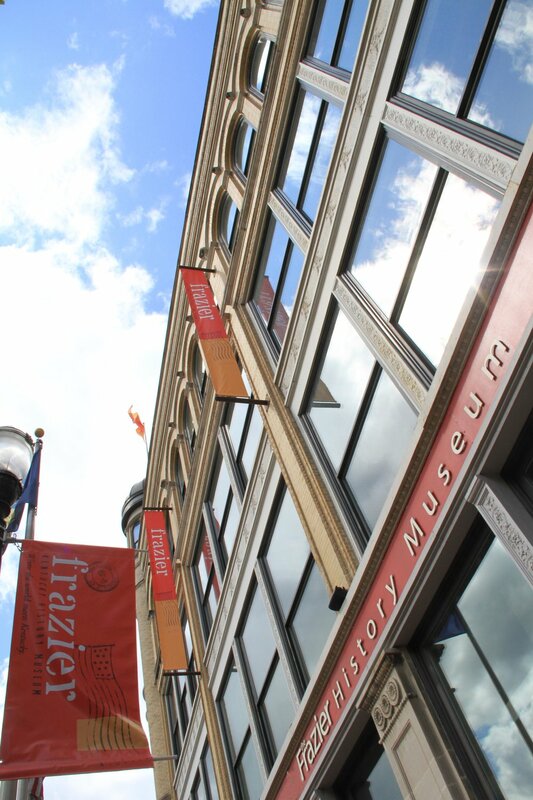 Insider Louisville mentions that the Frazier History Museum brings Bourbon culture to life. Read more here! Distillery Trail featured more information about the Frazier as the official starting point of the Kentucky Bourbon Trail® and the new Kentucky Bourbon Trail® Welcome Center, even including a sneak peek of its design. Click here for more information! The New York Times included the new Kentucky Bourbon Trail® Welcome Center in its recent article about spirits-driven tourism. Click here to read the full article. The Voice Tribune recently published an article about the grand opening of the Frazier's new garden entrance. The article also talks about what is in the garden and the history of some of the items featured in the garden! Read more here! Vogue Paris covered the Magnificent Mona Bismarck exhibition. The article mentions some of the Countess' amazing fashion, as well as, details surrounding her personal life. Browse through the photo gallery here! The Rusty Satellite Show recently featured the opening of the Frazier garden and showed off the new bourbon trailhead! Our very own Andy Treinen was featured! Read more here! KET mentioned the Magnificent Mona Bismarck exhibition in their May 29th broadcast. Watch the video here! The Lexington Herald Leader mentions that the Frazier's Prohibition and Kentucky Exhibition was visited on the initial tour that State Travel and Tourism Commissioner, Kristen Branscum organized for the Producers of Top Chef! Read the article here! Forbes magazine mentioned the Frazier in their article Couture and Kentucky: Magnificent Mona Bismarck Opens At The Frazier History Museum. Read more about our very own Kentucky Countess, Mona Bismarck, and the Frazier's exhibit here! Garden and Gun Magazine praises Mona Bismarck, one of the twentieth century’s most famous style icons who grew up in Louisville, Kentucky. She always carried a piece of Kentucky out in the world. Read the article here! Louisville's iconic socialite Mona Bismarck lived a truly unbelievable life. The Mona Bismarck exhibit at the Frazier Museum offers guests the opportunity to experience her extraordinary life through her world-renowned wardrobe, as well as personal letters to and from some of the most influential and remarkable figures of her time. Read more about Mona's exhibit here! The Voice Tribune calls the Mona Bismarck exhibit at the Frazier History Museum "Truly Magnificent." Read the Article here! The Frazier History Museum dedicates exhibit to fashion icon of the 1920s, Mona Bismarck. Given all of her achievements, it is surprising that not many people in Kentucky know who she is. The Frazier is trying to change that! Read more here! Dave Danielson, Executive Chef of Churchill Downs, and Tim Laird, America’s CEO - Chief Entertaining Officer, will be at Frazier Museum for the national launch of their book, The Bourbon Country® Cookbook: New Southern Entertaining. Read more here! Former head of Sotheby’s jewelry department and owner of the Verdura and Belperron archives, Ward Landrigan, shares the remarkable history of two master jewelers, Duke Fulco di Verdura and Suzanne Belperron, and their emergence onto the world scene in 1920s and 30s Paris. Read more here! Ronni Lundy, the James Beard Book of the Year Award-winning author of the cookbook Victuals; Annie Pettry, owner of Decca and contestant on Top Chef season 14; and Kristin Smith, a sixth generation family farmer, chef, and co-owner of the Wrigley Taproom & Brewery in Corbin, Kentucky will be cooking signature dishes for Farm to Frazier: An Evening with Female Chefs of Appalachia. The first in our Farm to Frazier: A Kentucky Supper Series. Read more here! Balenciaga is one of the most important and revered fashion designers of the twentieth century. Stephanie Wood, curator at London’s Victoria and Albert Museum, will explore the inspiration and influence of this renowned Spanish couturier, and his connection to a Kentucky-born muse, Mona Bismarck, subject of the Frazier’s newest exhibition Magnificent Mona Bismarck: Kentucky Style Icon. Read more here! Bourbon fans go to great lengths to purchase Buddy Thompson's rare and exclusive 45-year-old bourbon at Frazier Museum. Read more here! “Family Gathering: Linda Bruckheimer’s Kentucky” is on display at the Frazier Museum in Louisville, the exhibit has been extended until Sept. 29, 2018. Read more here! The Oscar Getz Museum of Whiskey History is preparing for the prohibition exhibition from the Frazier! The exhibit will be open to the public in June of 2018. Read more HERE! Tops Louisville describes the 45-year old barrel of Final Reserve, James Thompson & Brother Bourbon that goes on sale at the Frazier on March 1! Read more here! The Voice Tribune mentions Museum Row on Main Street has wonderful attractions that is offering $5 deal for the month of February! The Muhammad Ali Center, Frazier History Museum, Louisville Slugger Museum & Factory and SCENE at the Center located in The Kentucky Center for the Performing Arts are all participating in this promotion! According to the Lonely Planet, top 10 underrated, rejuvenated and out-of-this-world spots to visit in 2018 is the Bourbon Country including Louisville, Kentucky. Famous for the Kentucky Bourbon Trail starting at the Frazier! The Courier-Journal talks about the Frazier getting a liquor license and the 45-year old Bourbon that can be tasted on the Final Reserve Event on March 1. Read more here! The Louisville Magazine focuses on Bourbon in Louisville and mentions how the Frazier is the starting point of the Bourbon Trail. Read the article here! The Lexington Herald Leader reviews Family Gathering: Linda Bruckheimer's Kentucky exhibition on now at the Frazier. Read the review here! Kentucky Living talks about the James Tompson & Brother Historic Bourbon, 45 Years in the Barrel, to be sold at the Frazier History Museum. Read the article here! 356 Atlanta Family lists the Frazier as one of the 31 Things to Do In Louisville, KY For a Superior Time! see who else mad the list here! The Courier-Journal gives a break down of Nutcracker The Exhibition: 60 Years of Magic and Majesty. Read more here! Kentucky Distiller's Association and Frazier History Museum sign contract to create Kentucky Bourbon Trail Welcome Center Exhibit. The Frazier History Museum will be “The Official Starting Point of the Kentucky Bourbon Trail Craft Tour®” Read more here! 89.3 WFPL gives insight to what Mayor Greg Fischer has to say about the Frazier History Museum and the Kentucky Bourbon Trail working together. Listen and read here! WTVQ talks about the Frazier History Museum being “The Official Starting Point of the Kentucky Bourbon Trail Craft Tour®” and how it is the perfect place to start the Bourbon Trail. Read more here! CNN travel lists The Hunger Games: the Exhibition at the Frazier as a "place to geek out... as you explore the wide world of Panem" in their 15 charming Cities in the American South you may have overlooked. The Tennessean gives a wonderful review of The Hunger Games: The Exhibition describing it as both stunning and haunting. Read more here! Good Morning Cincinnati discusses The Hunger Games: The Exhibition along with our Panem Citizens Card and our hotel partners. Watch here! The Courier-Journal names The Frazier as one of the 15 kid-friendly activities to do in Louisville through May 18-24. Read more here! WHAS11 gives an excellent preview of The Hunger Games: The Exhibition in this video story. The Lexington Herald reviews The Hunger Games: The Exhibition, describing it as "both exhilarating and unsettling." Read more here. The Courier-Journal gives a sneak peek of The Hunger Games: The Exhibition at the Frazier. Read more here! Allied Van Lines has listed the Frazier in their article "The Top Places top places to visit after relocation to Louisville" Read it here! Art, antique and design site Incollect features a piece on the Kentucky By Design exhibit. Read it here! Fun Things to Do names the Frazier as one of the Most Fun Things to do in Lou'! Get a little walk-through of Pearl Harbor with Good Morning Kentuckiana, and see a snippet of our wonderful teaching artist, Victoria Reibel, as Cornelia Fort, the first female pilot to die in the line of duty for the U.S. military. Watch it here! Insider Louisville gives great insight into Personal Stories of Pearl Harbor. Read about it here! A Morning That Changed the World: Personal Stories of Pearl Harbor opens in commemoration of the 75th anniversary of the attack. Read about it here, and watch it here and here! The Frazier Museum wins the Alice Award in publishing for Kentucky by Design! Read about it here, here, and here! Insider Louisville goes inside the museum's newest exhibition, Kentucky by Design. Read about it here! The Courier-Journal showcases Julius Friedman: Fifty Year Retrospective with beautiful images and the stories behind Friedman's inspiration. Read about it here! Arts and Antiques Weekly talks about Frazier's exhibition, Kentucky by Design, showcasing more than 100 examples of works on paper, decorative art, musical instruments, costume and tools. Read about it here! StyleBlueprint features the Frazier's Hip History Series, where entertainment meets education with arts, crafts, culture, and food. Read about it here! The Frazier launches a new summer series, bringing the community together through farms and food. Read about it here! The Frazier gives a sneak peek into the June 17th Old Forester Speakeasy party with CirqueLouis' experiential circus acts on WHAS11 Great Day Live. Watch the video here! The Frazier kicks off the Julius Friedman: Fifty Year Retrospective exhibit in the sweetest way. Watch the video here! The Frazier proudly opens the exhibit, Thomas Merton: A Familiar Stranger, in partnership with the Courier-Journal. Read about it here and watch the video here! The Courier Journal writes about Frazier President, Penny Peavler, and her plans to revamp the museum. Read about it here! The Courier Journal features the Frazier’s Prohibition Exhibition as option #1 for Kentuckians on Repeal Day. Read about it here! Insider Louisville takes a look at the opening of our 2015 Holidays Around the World. Read about it here! Louisville.com went behind the scenes to see construction of our new exhibition Spirits in the Bluegrass: Prohibition and Kentucky. Read about it here! WHAS 11 News previews the Frazier’s Prohibition exhibition opening media event. Read about it here! WAVE 3 highlights our President, Penny Peavler, at the grand opening of Prohibition and Kentucky. Read about it here! InsiderLouisville.com takes a look inside the exhibition Spirits of the Bluegrass: Prohibition and Kentucky. Read about it here! Leo Weekly published an article about Frank X Walker’s reinterpretation of York. Read about it here! The Courier-Journal highlights our exhibit in Metro Hall. Read about it here! Louisville BizBlog features our Doe Anderson exhibit, part of our Hometown History Series. Read about it here! Wave 3 published an article about the Frazier becoming The Official Starting Point of the KENTUCKY BOURBON TRAIL®. Read about it here.